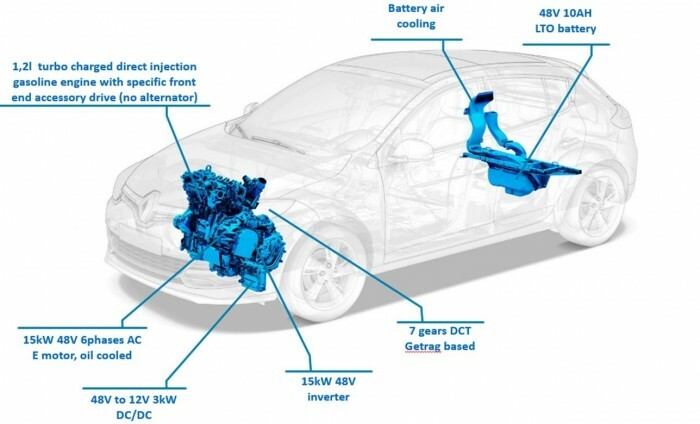 The motivation for developing a 48 V hybrid vehicle is to see if this technology can lead to a cost breakthrough compared to regular (higher voltage) hybrids. Many hybridization solutions are known at high voltage (~200V), which need specific components that are protected against electric hazards, making them relatively expensive. The benefit of a hybrid vehicle is (mainly) that it can recover energy during vehicle deceleration (i.e. mostly braking). An electric motor working at a lower voltage inherently delivers less peak power and can, consequently, also recover less energy. However, given an efficient energy management, a rather limited electric power does offer the opportunity of significantly reducing the CO2 emission at lower costs than conventional hybrids. 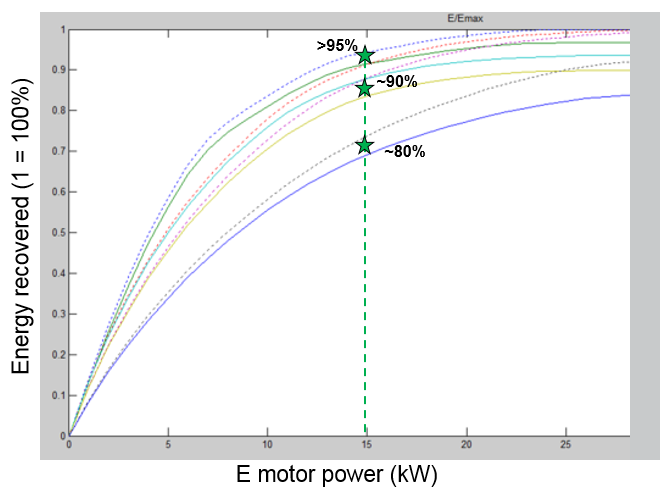 Figure 5‑2 shows the percentage of the energy that can be recovered during vehicle deceleration for different drive cycles versus the electric (e-) motor power. The general trend is that more energy can be recovered at higher e-motor powers, but the potential energy that can be recuperated depends on the power rating of the e‑motor and the type of drive cycle. At an e-motor power of 15 kW between 80 % (highway) and 95 % (urban) of the total deceleration power can be stored in the battery. A power of 15 kW can likely be achieved with a 48 V system, making it possible to take advantage of low cost 48 V components. Figure 1 Projected energy recovery during deceleration. The main technical and end user requirements for the 48 V demonstrator are given in the Tables below. Table 1 Main technical targets for the 48 V car demonstrator. 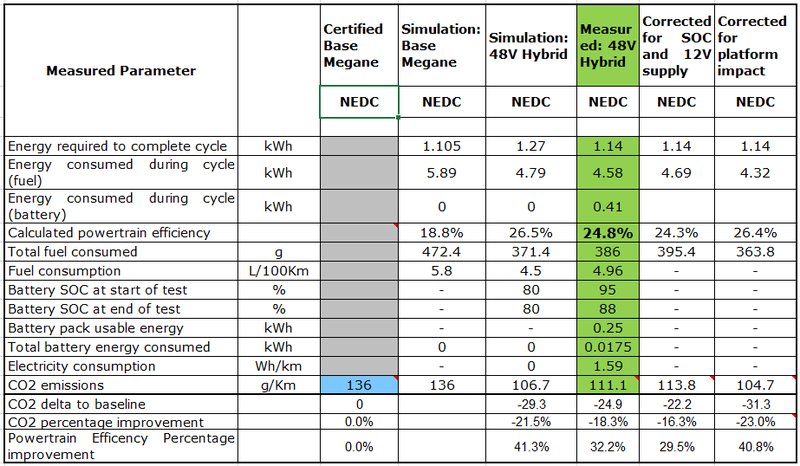 Table 2 Main targets for the end user requirements for the 48 V car demonstrator. The 48 V hybrid passenger car demonstrator is based on a Renault Megane. Figure 5‑3 gives an overview of the innovations that have been developed. The innovative architecture is that the powertrain is fitted with an e-motor that is directly coupled to a 7-gear double clutch transmission (DCT). By directly coupling the e-motor to the transmission, energy can be saved, e.g. by regenerative braking, acceleration assistance and limited EV operations. At the same time, this solution fits within the vehicle packaging and is a lower cost solution, which makes a rapid market uptake likely. The powertrain has been developed with a state-of-the-art electrical machine, rated at up to 15 kW when running at 48 V. However, an advanced 25 kW electrical machine and its power electronics are also being developed, targeted to fit the same practical package. Galvanic isolation is not necessary, and a specific crash protection is not needed thanks to the low voltage level. 48 V components are soon to be expected in mass production (components for 48 V belt starter generator, battery, DC‑DC converter, plugs, connectors and related controls). No additional component except one extra gear. A high speed motor for a small size. Internal oil cooling for a high performance. Careful sizing of electrical components to keep them as small as possible. Figure 3 shows the electric topology of the demonstrator vehicle. As can be seen, the 48 V battery is integrated in the rear of the vehicle, whilst the DC‑DC converter and the vehicle 14 V battery are integrated within the engine room. The inverter for the e‑motor, which is integrated within the transmission, is connected directly to a side e‑motor. The demonstrator car has been built and tested within Renault’s facilities: the results are encouraging. The Figure shows the tuning loops that were necessary to comply with the Euro6b regulation. At the end of these optimization loops, the emissions were below the requested levels. Based on that tuning, the CO2 measurements were performed. The Table shows the results. The expected emission, estimated by simulation, was 106.7 gCO2/km (shown in dark red on the left). The raw result measured on the test bed was 111.1 gCO2/km (shown in the orange box in the middle). This raw result was corrected with the traction battery state of charge (SOC) variation, the 12 V network consumption deviation and the platform drag deviation. After applying these corrections, the final result was 104.7 gCO2/km (shown in the light red frame on the right). These CO2 emissions are slightly better than expected (104.7 gCO2/km vs. 106.7 gCO2/km simulated). This result confirms the potential of the 48 V hybridization, at a far lower cost, even if the car performs slightly less than the high voltage solutions. Concluding, Renault and Daimler have succeeded in creating a viable 4 8V hybrid demonstrator vehicle that can compete convincingly with the performance of high voltage hybrid competitors in a similar vehicle class, but at a much lower cost. This being said, the powertrain is larger and heavier than expected. Nonetheless, mass and volume savings in serial production are encouraging and will be much closer to targets, but ultimately the targets set by ECOCHAMPS were unrealistic for these metrics. Still, passenger space is not significantly affected, so there is no direct impact on the final customer. Another deviation is that the NVH of the demonstrator car was little behind the targeted level for a serial car, but this was related to the maturity of the demonstrator and not intrinsic to the concept. The technology as demonstrated though the car during the final evaluation event can be considered as TRL7. Figure 7 (a) Benefit to increase the E-motor power (b). Allocated volume for the E-motor. (c, d) High power E-motor. (e) High power inverter. 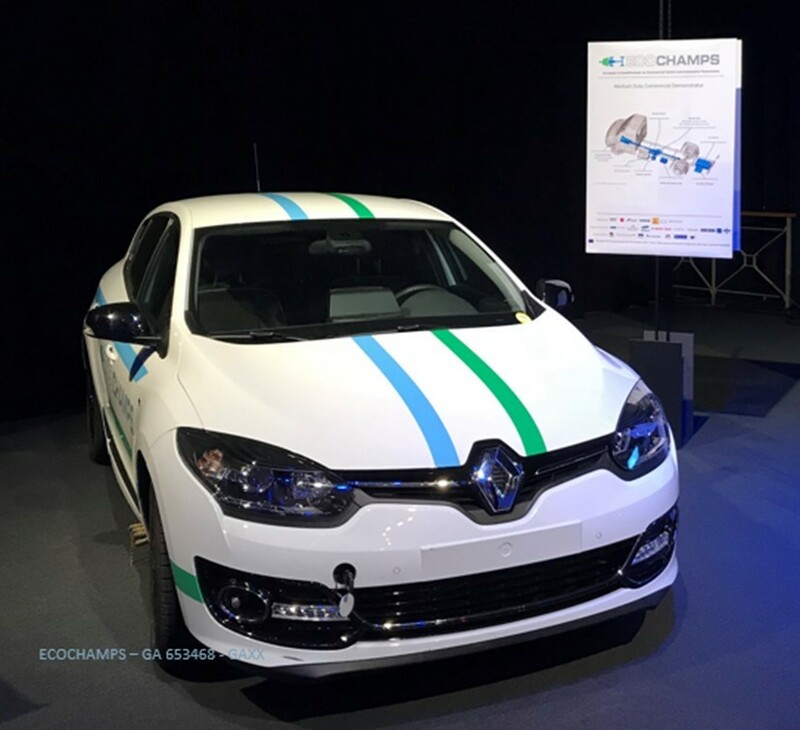 Whilst in the demonstrator car a 48 V 15kW e-motor was implemented, a 25 kW e-motor was developed and built in ECOCHAMPS. As mentioned, an electric motor working at a lower voltage inherently delivers less peak power, can consequently recover less energy, and offers fewer possibilities of improving the fuel efficiency. Therefore, it is worth the effort to study the possibility of a high-power 48 V e-motor. Figure …(a) shows the benefit in recovered energy. 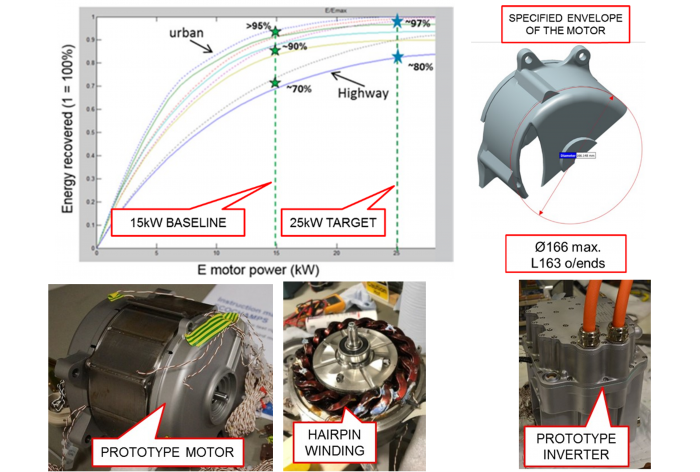 The targeted power for the high-power e-motor was set at 25 kW. Given the space to integrate the e-motor, the challenge was to fit 25 kW e-motor the same packaging as the 15 kW e-motor. Figure …(b) shows the maximum dimensions. The prototyping led to the samples shown in Figure …(c), (d) and (e). The operating envelope was simulated and tested: the bench tests indicated a performance limit of about 22 kW. On that basis, the partners are confident that it is feasible to reach 25 kW, assuming the inverter can be upsized. The confidence in reaching 25 kW, combined with the 15 kW CO2 results obtained by test shows that the 48 V system performance can extend the scope of low-voltage hybrids, and is competitive with the high voltage hybridization.